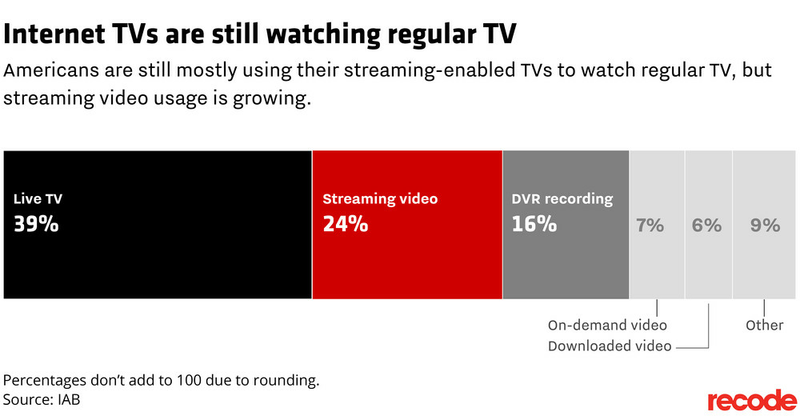 People who do stream online video like Netflix are doing so more often. More than half of all Americans, or 56 percent, have the ability to watch internet video on their TVs — but they’re still watching regular TV most of the time. Since 2015, there has been a 20 percentage-point increase in the share of adults who can get internet video on their TV, either through the TV itself or by using a device like a Chromecast, according to a new report from ad trade agency Interactive Advertising Bureau. But a large portion of the time (39 percent), people are using these TVs to watch old-fashioned live TV. As for internet video, they’re streaming Netflix or YouTube or Hulu about 24 percent of the time. Fortunately for subscription streaming services like Amazon and Netflix that offer TV-on-the-internet packages, that share is going up. People who do use their TVs to watch Netflix or Hulu are doing so more often. About half (46 percent) of people with streaming-enabled TVs watch streaming video daily, up from 32 percent in 2015.